On Monday May 23rd, 2016, the co-organizers of the event celebrating the “100 Years from the Sinking’s of S/S BURDIGALA & HMHS BRITANNIC”, namely the Municipality of Kea and the Friends of Kea Society-SFK, assisted by the Asset-Ogilvy Public Relations company based in Athens, Greece, staged a Press Conference at the auditorium of the Acropolis Museum. With about 35 Press persons attending, the Head of the Southern Aegean Islands Periphery Mr. George Hadjimarkos opened the session. Followed by the Mayor of Kea Municipality Mr. Yiannis Evangelou who presented the identity and the current priorities of the island. He announced that in collaboration with the Greek Ministry of Culture Agency responsible for the Underwater Antiquities, the Municipality is planning an ambitious program for the establishment of the HMHS BRITANNIC as an uderwater Museum plus the setting up of an U/W Exhibition Center on a renovated by the sea building. Following that, the President of SFK Mr. Byron E. Riginos proceeded to present the structure of the Event with all its planned activities commencing on Friday 30th September through Sunday 2nd October 2016 on the island o Kea. He also stressed the importance that the Organizing Committee places on it’s rolling Crowdfunding and Sponsorships program as well as the ‘Carl Spencer‘ scholarship program aiming to assist the top ranking students graduating from the Lyceum of Kea. It so happened that during the Press Conference a salutation message was received from one of the Conference Speakers, none-other than the younger son of Captain Jacques-Yves Cousteau, Pierre-Yves Cousteau, CEO & Founder of the Cousteau Divers Organization and Goodwill Ambassador of the International Union for Conservation of Nature. Kalimera-sas ladies and gentlemen, I wish I could be with you all today to promote this historical event. As some of you may know, I am a huge fan of Greece and I can only go a few months without a good Saganaki, so expect to see me again in your beautiful country soon. My father truly revealed so many mysteries of the sea to mankind during his incredible career, including the discovery and filming of the Britannic in 1976 inspiring people around the world to expand their minds and hearts beyond mere materialistic concerns, inviting us to dream. Today, more than ever, we need dreams. Thank you for the work you do and I really hope to visit you in September this year. 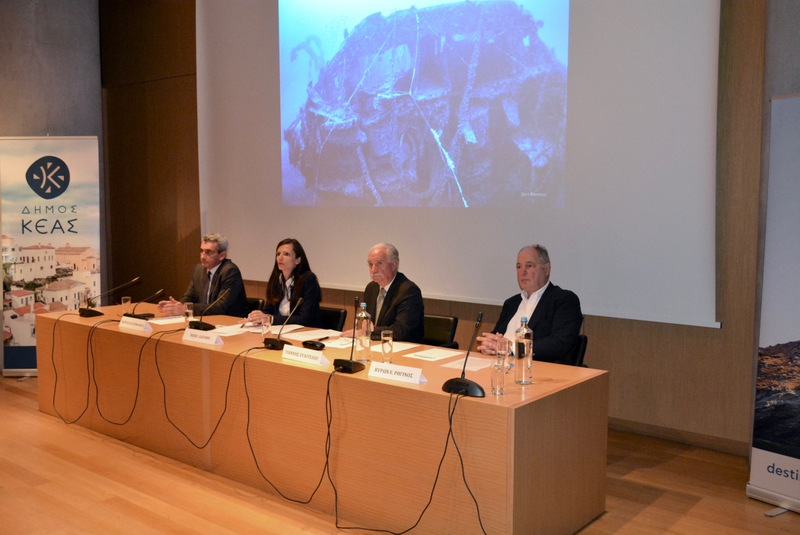 Afterwards, the Ephorate of Marine Antiquities Dr. Angeliki Simosi made a presentation about the two monuments of S/S Burdigala and HMHS Britannic, announcing that an application has been filed for the inclusion of Britannic as a UNESCO World Heritage Monument! After a Q & A session the Municipality of Kea offered a cocktail at the smart verandas of the Acropolis Museum Cafeteria. During the networking session over a glass of red wine, Mr. Hadjimarkos made the suggestion that the Periphery of Southern Aegean Islands become the third co-organiser of our Event, which was upheld unanimously! The ensuing publicity has been tremendous! Next Post New Auspice granted! What plans are there for the Britannic wreck? Will there be manned submersible trips to the wreck for tourists? Will the wreck be turned into the first underwater museum? Is the Britannic recognized as a UNESCO World Heritage monument yet? What preservation efforts are there to preserve the Britannic? 1/ manned submersible. There are some discussions, even a trial was made recently with a Triton 3000 (3 man type), but the expenditure is very high to make it a viable proposition… will have to wait for further news. 3/ Re UNESCO recognition, will have to ask Simon Mills about this.